Breakfast at hotel. After the breakfast, we start the walking tour from the centuries old Kale, Skopje Fortress. We continue to the Old Turkish Bazaar, mingling with the locals, meeting different cultures and religions, seeing old forgotten crafts. After that, we go to the Museum of Macedonian Struggle, with possibilities to visit the Archaeological Museum of Macedonia, that has one of the biggest ancient coins collection in the world exclusively from Macedonian territory. We walk across the Stone Bridge, the landmark of the city, and admire the biggest monument and fountain of Alexander the Great. The next stop will be the Memorial House of Mother Teresa. She was born in Skopje in 1910. After that, have lunch in a national restaurant. Free time for exploring Skopje, on your own. Dinner in the winery restaurant “Kamnik” with wine tasting. Overnight in the hotel. Breakfast. We are driving to Kratovo (95 km), a little medieval town founded in the middle of a once-volcano crater. First, we will have a guided walking tour around the town, crossing many medieval bridges and towers. We will see a unique small museum with artefacts dating all the way back from the 20th century B.C. till nowadays. 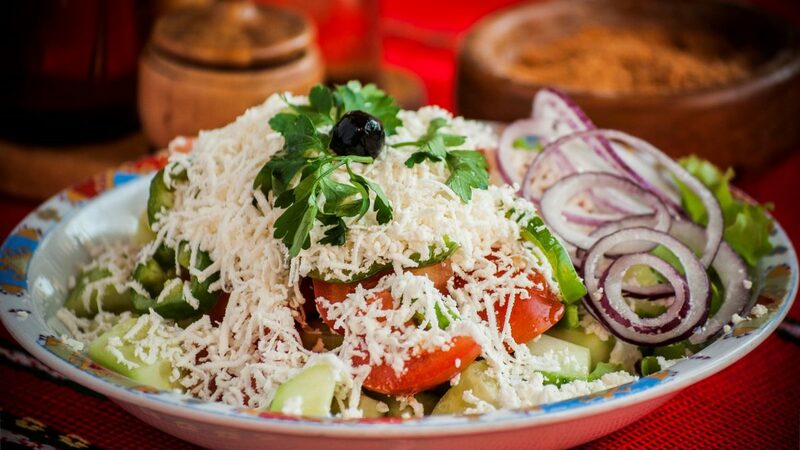 Then, we will have a chance to taste slowly-cooked food by the locals and a chance to taste the local homemade wine and rakija (Macedonian brandy). 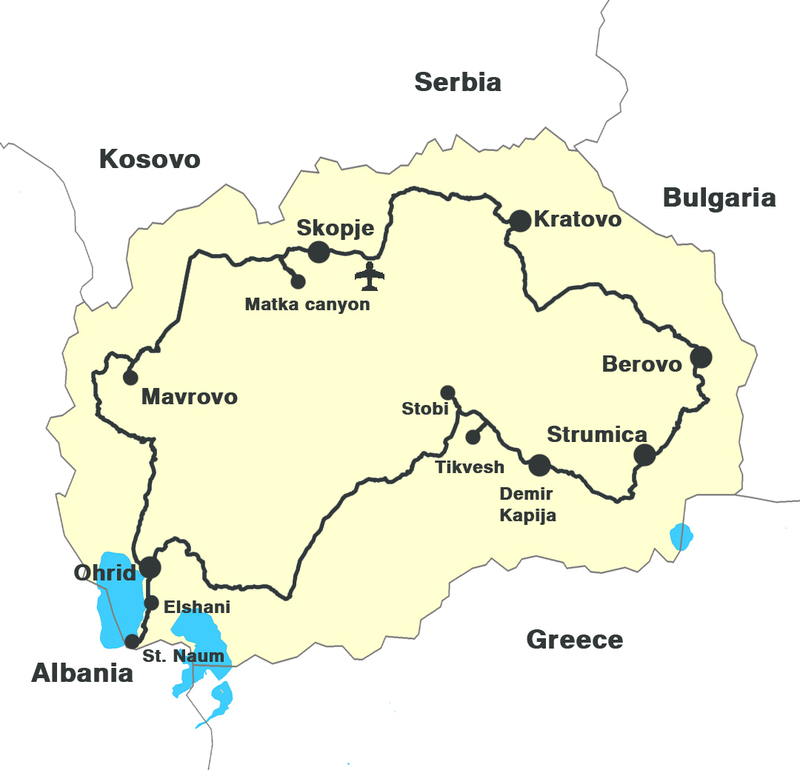 After that, we will drive towards Berovo (110 km). Accommodation in a hotel. Dinner in a local national restaurant. Overnight. Breakfast at the hotel. We will drive (8km) close to Bacilo (tea hut), then have the option to walk to Bacilo about (800 m) steep terrain, or to use a tractor from the main road to the tea hut. It is a private property in the middle of the mountain and the owners grow their own fruits and vegetables around the hut and have their own cattle. They will take us around the property and serve us homemade food. After that, we come back to Berovo and have some free time to stroll around the Berovo Lake. Overnight. Breakfast. We are driving to the village Koleshino (70 km), a small village with 4 different Christian religions. There, we will visit the beautiful Koleshino waterfall. Just 4 km from the waterfall is a small village named Gabrovo, where we will have home-hosted lunch and folk music performance by local musicians. After that, we will drive to Demir Kapija (70 km) and be accommodated in the Popova Kula winery hotel. Dinner with wine tasting, in the restaurant of the winery. Overnight in the hotel. Breakfast. We drive to the biggest archaeological site in Macedonia, Stobi (38 km). The oldest synagogue in Europe, from 1st century A.D. is found in this archaeological site. We continue driving to the next winery that has the same name as the archaeological site, Stobi Winery. We will take an organised tour around the winery, then have lunch and possibility to taste some of the wines from this well-known winery. We drive back to the hotel in Demir Kapija (38 km). Free time. We are driving towards the biggest and the oldest winery in Macedonia, and one of the biggest in Europe, winery Tikvesh (32 km). The professionals here, will take us through the cellars and talk about the history of the winery and the whole wine making process. We will then have a chance to taste some of their wine in its own restaurant in a beautiful atmosphere, with some specialities cooked from their chef just for us. Overnight in the hotel. Breakfast. We are driving to the town of UNESCO, Ohrid (200 km). Accommodation in a hotel. Lunch in a restaurant. Start the Ohrid City Tour, one of the oldest towns in Europe, full of history with traces of four thousand years of civilisation. We will visit famous untouched medieval churches, the fortress of King Samuel with a beautiful panorama, the ancient Macedonian-Roman theatre, we will be sailing with small boats on the way back to the centre. Free time on your own. Dinner in a national restaurant with a folk ansamble and traditional Macedonian songs and dances. Overnight in a hotel. Breakfast. We are driving to Elshani (12 km), a beautiful mountain village with excellent view on the Ohrid Lake. There, we will have the chance to ride donkeys and to mingle with the locals. After that, we will have home-hosted meal with the locals. In the afternoon, we will visit the unique prehistoric settlement on water from the Bronze Age – Bay of Bones (8 km), the most visited site in Macedonia. We will continue to drive to the extraordinary monument of nature – the lake springs and the monastery of St Naum (14 km), built in the 9th century. Transfer to the hotel (29 km). Free time. Dinner on your own. Overnight. Breakfast at the hotel. We drive to the biggest national park of Mavrovo (112 km). We will visit the cave Sharkova dupka. After that, we are driving to the most famous Macedonian village Galichnik, situated 2.000 meters above sea level in the middle of a national park. We will visit a tea hut (Bacilo) and our host will help us ride horses, milk some goats and sheep and walk around the nature. Here, we will see the Macedonian breed of shepherd dog called Sharplanin dog, which weights up to 80 kg. 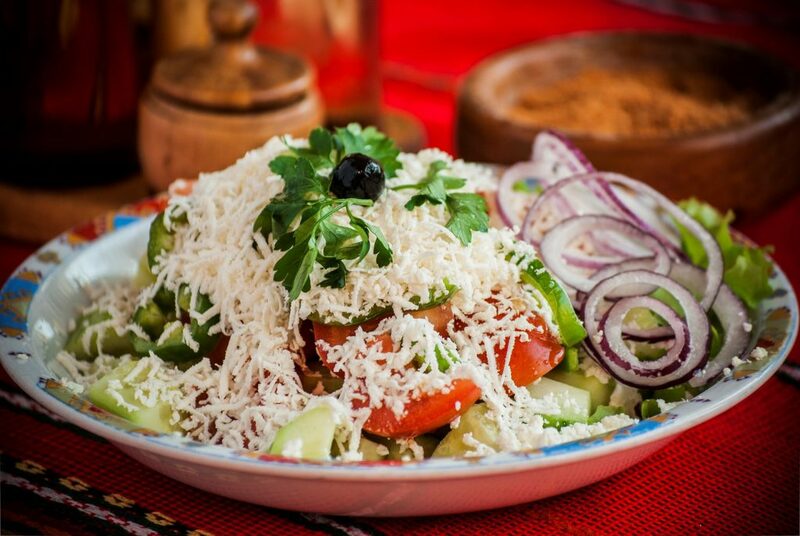 We will also taste Macedonian cheese delicacy and other products of sheep and goats from this area. After that, we are driving close to the capital Skopje and visit one of the most beautiful canyons in Europe, Matka (90 km), on the river “Treska”. With small boats we will set sail 6 km upstream to visit the cave Vrelo, full of cave decorations, like stalactites and stalagmites. Accommodation in a hotel (18 km). Farewell dinner in a national restaurant in Skopje. Overnight.